ASUS has announced its slate device which is known as ASUS Eee Pad, The Ultra-slim and light slate device is being designed to provide users with a real time cloud experience. The Asus Eee Pad is available in two models, which are Eee Pad EP121 and EP101TC. The ASUS Eee Pad EP121 is a full-featured slate computer which serves as a multimedia player, e-reader and compact computing device. 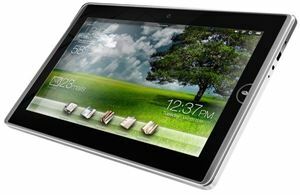 The 12-inch Eee Pad EP121 is powered by a CULV Intel Core 2 Duo processor and the Windows 7 Home Premium operating system for deliver high performance to handle multitasking tasks which enable users to check their mail, having video conferences or editing documents simultaneously. Besides that, the Eee Pad EP121 also offers two continent modes of character input-an embedded virtual keyboard or an innovative hybrid keyboard/docking station design. To enhance the mobility, it has come with battery that provides up to 10 hours of battery life. The Asus Eee EP101TC is featured with a 10-inch display and runs on Windows Embedded Compact for provide an engaging user experience and delivers instant connectivity to the Windows world. The 10-inch Asus Eee EP101TC is also provides a familiar full-featured user experience across various connected devices and cloud computing services. The ASUS Eee Pad is expected to start shipment by early 2011. The ASUS EP121 and EP101TC is expected to be at the price of $499 and $399 respectively.